The challenge in writing about John Mellencamp is to somehow put into words the work of a master with words. A rocker who, at 67, still comes out swingin’ and grinnin’ at any opportunity to fight authority. It was classic Mellencamp on Saturday night at the Weidner Center, where a sold-out crowd of 2,000 fans were reminded the songs that instantly take them back and put a smile on their faces sound all the sweeter after you’ve been lucky enough to put on a few miles. That goes for the guy from Bloomington, Indiana, on the stage and the fans who have been along for the ride for the last 40 years. The thing about talking about old times, Mellencamp said before he played the nostalgic “Cherry Bomb” to end the concert, is you have to be old to do it. Judging by the audience reaction all night, it was a perfectly fair trade-off. John Mellencamp had a sellout crowd at the Weidner Center singing along to classic hits "Jack & Diane," "Pink Houses" and "Small Town" on Saturday night. For his latest trek, billed as The John Mellencamp Show, there’s the inevitable buzz about how he’s bringing the heartland to cities across America, but what has always felt special about a Mellencamp visit to Green Bay is that the heartland is already right here. It’s our common ground, and he’s "our guy." It’s a shared experience that say, Oakland, California, or Clearwater, Florida, doesn't get to claim. After a 25-minute film about his life to open the evening, Mellencamp joined his six-piece band and did what he does best. He rolled up his sleeves, flipped up his collar, ran his fingers through his graying Johnny Cougar hair and got to work. No phones allowed. And please, no loudmouths during the quiet portion of the show. 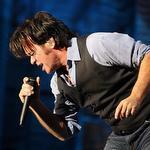 “Being a drunk dumba-- is not really appreciated in this show,” Mellencamp warned early on. “I know because I used to be one." Would you expect anything less from a Rock and Roll Hall of Fame and Songwriters Hall of Fame inductee who has made being plainspoken an art? It was a louder, more hard-driving show from Mellencamp and his band this time than his previous two visits to the Weidner — a spectacular venue at which to witness him work his magic. When he hit his stride with “Rain on the Scarecrow, “Paper in Fire” and “Crumblin’ Down,” it had all the makings for an arena concert, but what a thrill to have it happen in a theater. Perhaps his choice of venues is a nod to the advice legendary folk singer Pete Seeger once gave him and he's never forgotten: "Keep it small and keep it going." Mellencamp's voice has become more weathered with age, not unlike another American poet, John Prine, and it gives his songs a well-worn feel, like all the glorious nuances that come with a needle on a vinyl record. Classic.